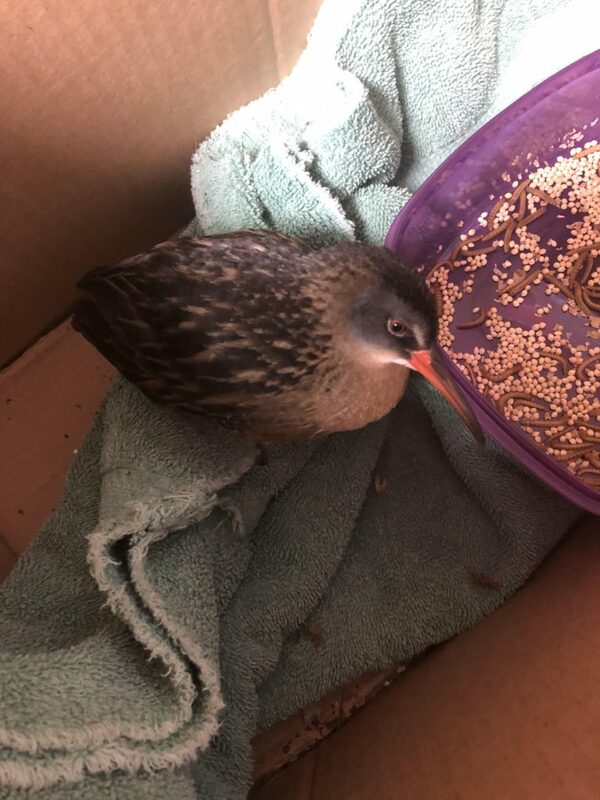 Virginia Rail – A Successful Rescue! Last weekend’s Bird Walk at the Edsel & Eleanor Ford House was rescheduled due to rain, but a few people showed up anyway, so we decided to slog around for a while to check for birds. During that short time, we saw Cormorants, Scaup and Horned Grebes in the lagoon. Soon, the winds and rain picked up to the point where we had to call it a day and head indoors. So of course I said, “Sure, I’ll go check it out!” And I am so glad I did! There, huddled in the towel that had been placed around it, sat a Virginia Rail, a secretive, marshland bird who must have recently migrated. My first experience with a Virginia Rail was at Point Pelee, a place where I went birding often, beginning in my teen years. The East Beach Marsh was where I first saw this bird. There were other sightings throughout the years, including a notable one in my own yard in Grosse Pointe Woods. 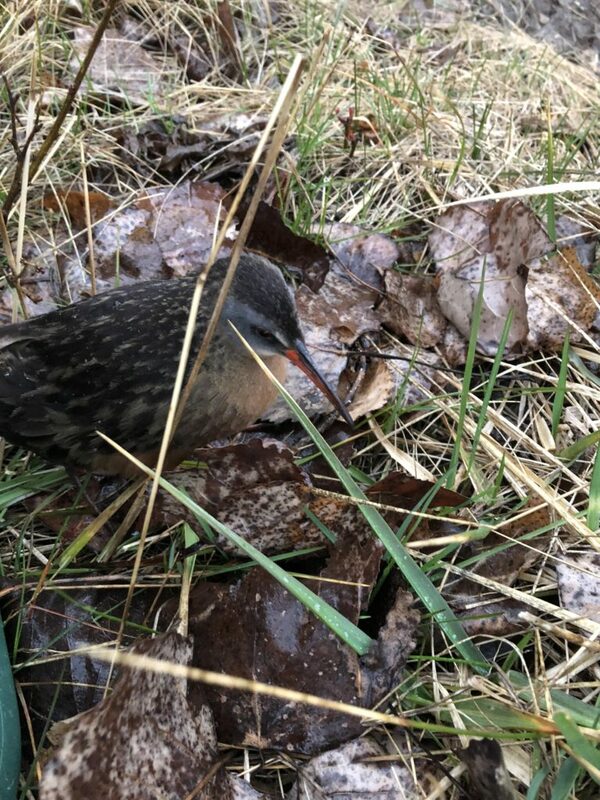 A Virginia Rail once spent the day in the yard, tucked next to the house, before it left that night. Sadly, the marshes where these birds stop and rejuvenate with food are now few and far between, especially for a travel-weary bird. I gently scooped it up the bird and placed it into a box. My next move was to message Andrea Aiuto, Director of the Bird Center of Washtenaw County. Although I knew the center was not open to accepting birds at this time, Andrea was a very reliable source for me to help determine what to do with the grounded bird. There did not appear to be any obvious signs of damage to the bird (such as a drooping wing). We assumed the storm may have grounded the bird in a place that provided no suitable habitat. After all, a sidewalk in Grosse Pointe is the least likely place for this bird to be! Andrea recommended feeding mealworms and millet in a shallow dish. Lucky for me, I knew we had both at Wild Birds Unlimited, so a quick stop to my store was in order! As instructed, I kept the bird in a quiet, dark place to minimize agitation. Each time I took a peek, its head was under its wing. I felt good that it was safe from the pelting, cold rains. At some point, the Virginia Rail began to strike against the tote. I knew the bird of course wanted to be released, and while I felt relief that the bird was active, the weather was not ideal. With assurances from Andrea that the bird would settle down, I tried to ignore the movement and the noise, which eventually abated. I resolved to get the bird to the Howell Nature Center (HNC) for professional care the next day. The next morning we were greeted by a covering of ice everywhere. Driving was not going to be a safe option. I called HNC to find out what else I could do for the Virginia Rail as it appeared not to be eating the live mealworms. The advice I was given made sense – this bird has a beak meant to probe the marsh for invertebrates. 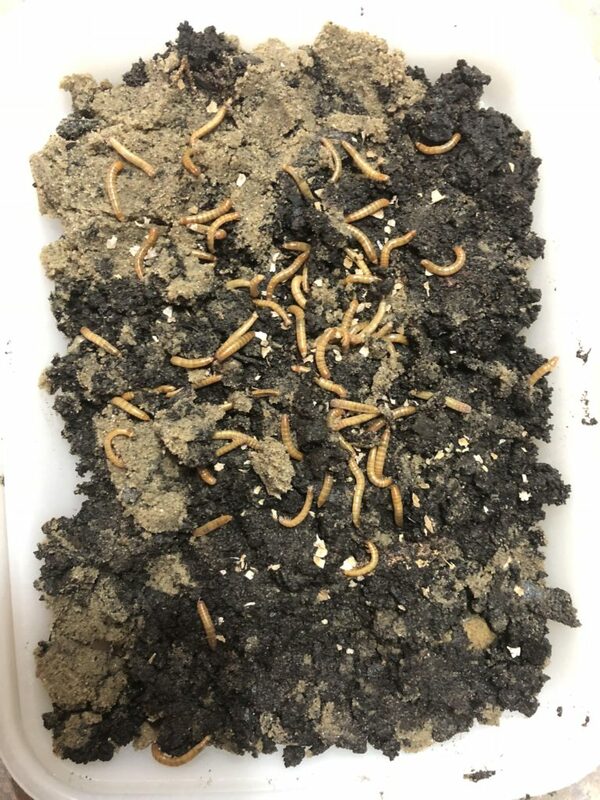 Get a shallow pan and fill it with dirt, mixing the mealworms in the dirt and placing some on top. The other bit of advice that I received was not to release the bird in the rain. Given the forecast, we were bound to be buddies for at least another 24 hours. The good news is that I could see the bird was eating. There were many mealworms gone and droppings on the towel. I eagerly supplied more of the wriggling morsels. The bad news was late in the afternoon, the Rail began to fling itself against the tote again. I begged it to calm down because of the rain. Unfortunately, there is no good way to explain this to a bird. That’s when the bird got the better of me – against advice I headed out to Lake St. Clair Metropark to release it. I felt that if it was strong enough to exert the energy needed to try to migrate, it was ready to get on its way. I also didn’t want it to injure itself in its attempts at freedom. When I got to the metropark, I found a spot very close to the marsh edge and carefully tipped the bird out of the tote. To my surprise, it just sat there. For fifteen minutes – fifteen long minutes while I waited in the cold rain and tried to talk some sense into the Rail. The birds’ response was to sit tight. Of course, I remembered I was not supposed to release the bird while it was raining. What was I thinking? The bird continued to cajole me by thumping against its plastic prison. Fifteen minutes later, the bird was in my gloved hands and taking a warm ride back to Grosse Pointe. When I arrived home, I provided more of the wriggling morsels and actually witnessed the Rail eating them. It looked healthy and active, with some flicks of the tail revealing the white undertail coverts, an action I had seen in the field. And so it was, back to that quiet and dark place as Andrea instructed. At 11:00 p.m. my bedtime reading of Audubon magazine was interrupted by the Rail again being insistent on escaping the plastic confines. I went to the back door. No rain. Grabbing the tote, I took it outside and took the top off. Ironically, this was very near the spot that the grounded rail spent in my yard. Alert, the rail began to look about with its neck outstretched. Then, in an instant, it flew straight up and then turned down the driveway, between the houses and out of sight – a strong and steady flight. I breathed an audible sigh of relief. It’s amazing how much of your heart and soul goes into saving a bird! I have a renewed respect for bird rehabilitators, and I was so grateful for the advice from Andrea of Washtenaw Bird Center as well as the staff from the Howell Nature Center. 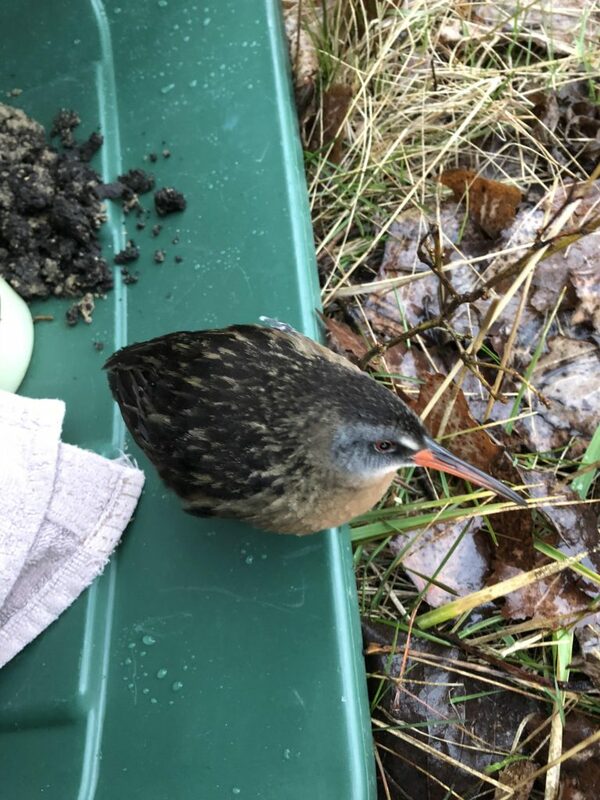 And I was really grateful that the Virginia Rail has a chance to make it to breeding territory and carry on the genes of such a determined little three ounce sprite.